Hadash Chairman Mohammad Barakeh arrived in the Tel Aviv Magistrate’s Court Sunday to testify in proceedings held against him for allegedly assaulting a police officer in 2005. Barakeh said: “I can’t believe someone in my position has to be dragged to court like this. 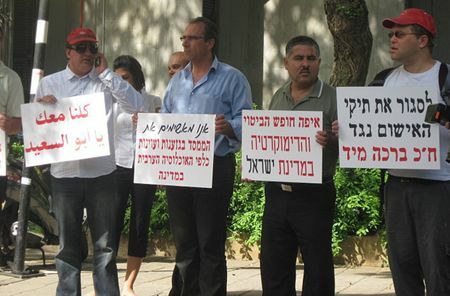 This is a cynical play by the prosecution.” On Sunday, the Magistrates’ Court of Tel Aviv began hearing defense witnesses in two indictment charges against (MK) Barakeh, Chair of the Democratic Front for Peace and Equality – Communist Party of Israel (Hadash). The first witness was MK Barakeh himself. 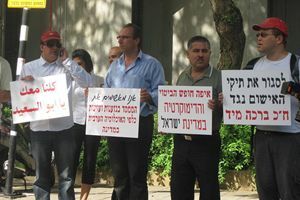 State prosecutors have charged MK Barakeh with assaulting a border policeman in May 2005 during a demonstration at the West Bank village of Bi’lin against Israel’s Separation Wall. During this demonstration, MK Barakeh was hit in the thigh by a sound bomb that was thrown in his direction. The prosecution alleges that MK Barakeh grabbed the throat of the border policeman to prevent the arrest of a Palestinian youth. The second charge is from July 2006, when the prosecution alleges that MK Barakeh assaulted a right-wing activist during a demonstration against the Second Lebanon War, despite the fact that MK Barakeh was defending an elderly activist, former MK Uri Avnery, from being attacked by the right-wing activist. Prosecutors’ witnesses were heard in April 2012. During their testimonies, blatant contradictions surfaced between their stories in the case files seven years ago and what they said in court. The court has also already dismissed two of four charges against MK Barakeh, deciding that they fell within his parliamentary immunity. MK Barakeh’s legal defense team – Adalah Attorneys Hassan Jabareen and Orna Kohn – emphasized that the dismissal of the two charges occurred during the preliminary proceedings in the case, i.e. before examination of the substance of the charges against him. This fact shows that the indictment is weak, flimsy and should be dismissed in full. The court scheduled a new hearing date in April 2012 to hear the remaining two charges on the indictment sheet, which MK Barakeh rejects in full. December 24, 2012 in Party Life.